Pak Suzuki has recently officially launched the Cultus 2017 in Pakistan having two variants including VXR and VXL and bit increased price tags. In a launch event the company has revealed its plan for 2018 as the Pak Suzuki will introduce the Alto 660cc car in Pakistan. 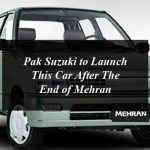 At the launching event of Suzuki Cultus 2017 in an event in Lahore on 22nd April the General Manager Marketing Pak Suzuki Azam Mirza revealed that the company has a plan to replace the existing Mehran 800cc with the new Alto 660cc by 2018.